I have already written my opinion about OpenSuSE 12.2 GNOME. Even if it was not perfect, I liked that OS. There was definitely an improvement, in my eyes, since the previous releases. After that, a member of OpenSuSE community Cyberorg contacted me and suggested to use his script for creation of a Live USB with OpenSuSE or Ubuntu for the BIOS of my laptop, which does not accept hybrid ISOs on a Live USB that was created with the command dd. The script worked well for me, and I wrote a separate blog post about this. 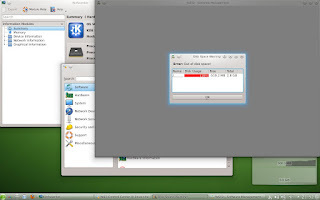 The guinea pig for the brand new method of Live USB creation was an ISO of OpenSuSE 12.2 KDE. Even though I did not intend to review this operating system initially, I now had no choice but to do this. Here we go. The size of an ISO image of OpenSuSE 12.2 KDE is 671 Mb and can be downloaded either from one of many mirrors, or from torrent. So, the USB stick is in the port of my Fujitsu-Siemens Amilo Pi 1505 laptop. Reboot. Choose to boot from USB. Let's go! 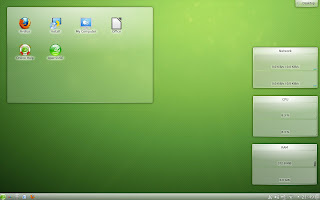 The boot menu of the Live USB with OpenSuSE 12.2 KDE, created by Cyberorg's script, contained only 2 major items: boot OpenSuSE Live and boot from hard disk drive. All the rest of the options available in the normal boot screen, like selection of system language, screen resolution or additional boot parameters, were there too. I chose to go for a Live run of OpenSuSE 12.2 KDE with English (UK) language, not the default US one. The boot process and the splash screen were no different from those of the GNOME edition, of course with the addition of a KDE-standard sequence of icons with globe, HDD, tools etc. The Gecko's head with some white moving spots was there, of course, as well as "artefacts" of sun-facing lenses, which look more like fingerprints on the screen. The boot process was not long. Finally, the system booted up to the desktop. I immediately added my favourite set of desktop widgets: CPU, memory and network monitors. The memory widget showed that freshly booted OpenSUSE 12.2 KDE uses over 370 Mb of memory, which was a shock. To compare, Mageia 2 KDE uses about 300 Mb, Fedora 17 KDE uses 270 Mb and openmamba Milestone 2 uses 290 Mb. 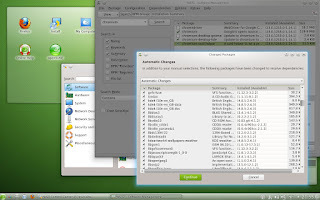 OpenSuSE 12.2 KDE uses KDE version 4.8.4 with Linux kernel 3.4.6. The desktop for OpenSuSE 12.2 KDE contains one folder packed with applications like Firefox, installer, LibreOffice launcher, Help shortcut and so on. The panel is at the bottom of the OpenSuSE 12.2 KDE's desktop. The panel has standard elements on it: the menu with Gecko's head is in the left corner. Activities and Virtual Desktop switchers are next to the menu button. The right part of the panel has a notification area with elements like clocks, network monitor, USB devices monitor, volume control, clipboard tool and so on. The rest of the panel is taken by the taskbar. Visually, the panel in OpenSuSE 12.2 is slightly narrower than in some other distributions I've seen. But it is good, from my perspective, as it leaves more space for applications windows. The default desktop wallpaper is in green tones with a net of tiny squares on it. There are the same artefacts as in the splash screen. Apart from this default wallpaper, you have an option to select KDE's standard image with stripes. If you need more images to decorate your desktop, then please be prepared to download them by yourself. Some desktop effects are available in OpenSuSE 12.2 KDE out of the box. For example, shadows for the windows and menus worked well for me. OpenSuSE 12.2 KDE had no issues with configuration of my wireless network card Intel 3945 ABG. My home network was listed when I clicked the Network Monitor icon on the panel. Usual ritual with password, and I was connected. Keyboard layouts can be configured in OpenSuSE 12.2 KDE in the Input Devices section of the System Settings panel. It was easy for me to add Russian layout to the existing English UK one. The only issue which I'd like to highlight here, is that languages in the list are noted by 3-letter abbreviations, like rus, est or fra. I was shocked! Why are they not the full names of Russian, Estonian or French? The touchpad was not configured to my liking by default. At least, edge scrolling did not work. The default menu in OpenSuSE 12.2 KDE has the Launcher style. Of course, you can easily switch it to Classical style in 2 clicks. Why do I mention this? Because, in my opinion, Classical style better fits the menu structure of OpenSuSE KDE. I mentioned this in my review of OpenSuSE 12.2 Li-f-e, and I will write here again: the menu has too many subsections. They are difficult to navigate in the Launcher menu style, but Classical style fits them just right. Firefox 14.0.1 is the default browser in OpenSuSE 12.2 KDE. There is also a Konqueror browser, which is quite common for KDE-based distributions. Apart from these 2 browsers, the Internet section of the menu contains Chokoq microblogging client, KMail and KTorrent. There is no internet messenger or IRC tool in the default distribution. Shocking, isn’t it? Don’t OpenSuSE developers like to communicate with each other? The Office tools in OpenSuSE 12.2 KDE include KAddressBook, Kontact, KOrganizer and some LibreOffice applications: Draw, Impress and Writer. There is yet another shock: as in the GNOME edition of OpenSuSE 12.2, no spreadsheet tool is included in the KDE edition. The Graphics section of the menu includes the same LibreOffice Draw, which I've mentioned above, plus Gwenview image viewer. The Multimedia section of the menu in OpenSuSE 12.2 KDE has some shocking things too. I mean that the video player Kaffeine is listed there twice! Both instances start the same application. Apart from Kaffeine, there are KsCD player, KMix and multimedia manager Amarok. There is no disk burning software in the default OpenSuSE 12.2 KDE distribution. There are 5 games in the default OpenSuSE 12.2 KDE, but for these 5 games you have (shock!) 2 subsections in the Games menu, each of them containing 2 applications. Isn't is an overkill? In addition, who would think that Miner is actually a Puzzle game? The overkill of subsections, which I first mentioned just above, is fully visible in the System and Utilities parts of the menu. There are 7 subsections in addition to 4 applications in the "root" of the System section, and 5 subsections in Utilities. Many of these subsections include only (shock!) one or two applications. Why would you need to have a separate subsection for a single application? Just to make the menu look more complicated? As for applications, the System and Utilities sections include a good selection of these. Usual suspects are all included: Kate editor, KRDC remote desktop viewer, Krfb desktop sharing tool, Terminal, System Monitor, Ark, Dolphin file manager and so on. As you can see, OpenSuSE 12.2 KDE comes more or less packed with applications. However, there is a very big chance that you will use the software management tool very soon after booting the system. Many applications which would be useful in everyday life are not included, like GIMP, LibreOffice Calc or VLC. YaST (or YaST2, to be precise) is the system management tool in OpenSuSE. It is a collection of different configuration utilities, and software manager is one of them. Once I started the software manager for the first time, it took some time to update the repositories. And... crash, boom, bang! SHOCK! At the end of the update process, I saw an error window in red colours: the system told me that the Live session does not have enough space for the proper repositories update. Urgh? Scare and close? If you do this, then how would I (or a new potential user) check the presence of software then? To check the installation process, I decided to install Chromium. The results were shocking! Software Management tool initially listed 2 other packages as dependencies, which sounded reasonable. However, just before installation commenced, the list of dependencies grew to several dozens of other packages, which would take several hundred megabytes of installation. Some parts of this list were rather unexpected. For example, what do LibreOffice MailMerge of GVFS have to do with Chromium? Finally, I interrupted the installation. I suspect that YaST2 took an initiative in its own hands and decided to update the whole system at the first possible possibility. That's a wrong approach by OpenSuSE developers, as I don't want to be imposed to decisions I cannot change. That reminds me an Apple strategy: the customer wants what it is told to want, not what he really wants. Even Windows allows you to choose which updates to install. But not OpenSuSE! OpenSuSE 12.2 KDE has a dedicated tool in the menu, called Network Folder Wizard (KNetAttach). This tool did its job wonderfully, and my fileserver's folder was mounted in almost no time. I tried to open an MP3 file from a remote partition. The default application for MP3 files is Amarok. Unfortunately, it cannot play files from remote partitions without copying them into a local library. Of course, it was not in my plan to create a copy of my music library in the Live session of OpenSuSE 12.2 KDE. I canceled the background copying. The second attempt to open an MP3 file was made with Kaffeine. It failed to open the file, and gave me an error about a missing plugin. The error window had a button to install the missing component. That was my choice. A sequence of other windows followed, but it did not give any positive result, until I clicked the provided link. Then, yet another sequence of web pages, and I got a "one-click install" link for multimedia packages. Indeed, it was not a true "1-click install", as it required some other confirmations, but that was not difficult. But, halfway through installation, I had to stop it. The reason was that, in addition to multimedia codecs, OpenSUSE 12.2. KDE shockingly decided to update all the rest of the packages. That was not in my plan, of course. I suppose this is the same issue that I faced during my Chromium installation. Just to test the sound abilities of OpenSuSE 12.2 KDE, I launched the Amarok player once again. As usual, it threw me a question about my location, to connect to the proper Amazon site, but I ignored that. Amarok took about 200 Mb of memory to load, which almost hanged my system. It again asked me a question about an MP3 support, plus its usual question about location of my multimedia library. At the end of the story, I was able to play the default Amarok's tune. And here I found a pleasant surprise. The volume control elements of my laptop, which are Fn-F5 and Fn-F6 key combinations, worked fine! I've never seen them working in any other Linux distribution yet. These keys usually hanged the X-server capabilities to react to other input devices like keyboard or mouse clicks. The reason, in my understanding, is that my model only produces signals from these keys when they are pressed, but not when they are released. Hence, X-server was in the dead loop waiting for the "release" code sequence. OpenSuSE 12.2 fixed this! At last! I hope that other distributions will follow the case! I installed Flash player from the OpenSuSE's repositories. In contradiction to my experience with the Chromium browser, this operation did not require an update for half of the system. My reaction to the OpenSuSE 12.2 KDE was a shock, to put it simply. KDE is always considered as a flagship desktop environment for OpenSuSE, compared to GNOME and other desktop environments. There are quite strong links between the OpenSuSE and KDE communities. What I've seen in GNOME and KDE versions of OpenSuSE 12.2 contradicts this fact. Where the GNOME edition was almost workable, if I were to agree with some functionality gaps of GNOME Shell, KDE left me frustrated. The performance of the system was far from ideal, especially when several applications ran in parallel in my Live USB run. There were so many minor and major issues, that I would never recommend this distribution to any of my friends. There are too many other Linux distributions, including those with KDE, that simply leave OpenSuSE far behind. You may disagree with my position... But then... that is my own. Do you want to try OpenSuSE 12.2 KDE (or GNOME) to make your own judgement? Maybe oher distribution? Then, why not order a CD with this distribution from the site Buy Linux CDs? The disk will be delivered right into your mailbox anywhere in the world. You make a crucial mistake: A live USB/CD/DVD session is not meant for real work on it. It was just meant as hardware test. Any, and I mean, any, "review" of any software that doesn't get installed and tested on raw metal, is by definition so severely incomplete, to be useless. You are not 100% correct. There are many reasons why Live CD / DVD / USB is still usable for real tasks. I've written this many times, and I am not going to discuss it again. If your only purpose for commenting is to point this fact, please refrain from commenting. Chakra has its own pro & contra. But I agree with you re OpenSuSE. openSUSE 12.1 with the LXDE desktop works great for me. Suse and OpenSuse have always run slow on all of my machines. I don't know what it is. Other distros have run much faster. Also, For several versions, now, I've found OpenSuse less and less cohesive as a distro than it used to be and the community isn't all that friendly or open to discussion that asks questions like "why doesn't Suse do this or that?". I have found no SuSE versions so far that would suit me. That's why I use other OSes. I found SuSE community more or less tolerant. Much more tolerant than, say, Aptosid community. - I didn't see any desktop artifacts at all. It was a very easy to use the GUI to configure an extended desktop between my laptop and monitor without any command-line trickery. - I didn't see double listing of Kaffeine in the menu. I like the classic menu better but the search facility of the new menu actually is faster (or Alt+F2 is even faster). - I do agree that there is something funny going on with the Software Management tool (zypper). Even for a simple application like "sox", the dependencies listed several hundred MBs of un-related packages. However, doing it from Yast2 (or command-line for those who are inclined so) downloaded only the needed packages. - Hardward detection was excellent - everything worked out of the box including multimedia keys on the keyboard. - They should *prominently* enable (e.g. put one-click links on the Desktop folder) users to install meta-packages e.g. Skype/Pidgin/etc. bundle for "chat", all audio-video plugins for "multimedia" etc. It is no fun to manually hunt and add repositories like "packman", "kde-extra" for the basic things (though installation of packages is pretty simple once the repositories are added). - Zypper and Yast2 need to be in sync for sofware packages. It would be much better if they can merge Yast2 into System Settings (or Configure Desktop as the caption shows) to provide a single and consistent front-end. I agree with your points that OpenSuSE has some things to polish yet. Although, I understand you're overwhelmed with KDE4 after GNOME. I can assure you: there's plenty of KDE4-based distributions which are better, IMHO, than OpenSuSE. I write this from my Mageia 2 KDE, for example. Think that is very snappy. and stable. Opensuse is easy to install and all the Multimedia Codecs are just one click away. Personal I think that a Review of a distro using a live-version little bit stupid. I never saw a live version that was as good as the installed version. For example my "live" experience with Mageia was terrible. Appreciate your opinion about SuSE and Mageia, but I'd ask you not to invest more time into the aggression against the Live system reviews. Like I said, I never saw a live version that was as good as the installed version. A installed version of SuSE is better then the live version. Just put that here as a comment. for the purpose of reviewing an OS, if you are so against doing a hard install, you should at least install vmware player or virtualbox or any other countless virtualization software. OpenSuSe is my main desktop os, my server OS,and my laptop OS. Kubuntu is my wife's desktop, laptop OS. One of your comments concerning the package dependencies is a failure to research before your post is made. by default (along with almost every other OS) "critical" and "security" updates are downloaded and installed by default. you can disable this feature inside of yast/software update. As far as people commenting about your decision to run live software and write a review....just look at your review. Of course you are going to get negative feedback. Great review otherwise. appreciate the effort and time you have taken to write the review. Gives us incite on what we need to work on as a community to improve the end user experience. one more thing, KDE is all about configurability and user individuality, while most other desktop environments (i.e. Gnome, Unity, Cinnamon, LXE....) are more geared towards "this is the way it works, if you dont like it, use something else"
I totally agree that sing a liv set isn't the best way to do an indepth review. K3B comes with the DVD; menus are polulated with more than just one or two applicatios with the DVD etc. Now. my Aspier 5680 boots oS 12.2 fast. fedora is faster; Ubuntu is so muc different that I generally don't look at. zypper is a geat and fast tool. the same solver is used for yast and zypper; if there are selection differences, it's due to a different query what to install probably. however I never noticed that for a start as I generaly only use zypper. If a good example can be given (say in a vm that can be transferred, I could ake a lok at what happens. Anyways, a live cd is workable but never ever comes close to a full instalation. If this concept is dismissed by you, I seriusly would question the whole thing here. You can question whatever you want, but this is my blog and my rules. I've been using it for almost a month, and I tell you, I'm loving it! I got rid of unity, and gnome 3, cinnamon, etc, they are just not ready, incomplete, and they are hugs, memory vampires. You should really do your testing right before you come to a conclusion that is not accurate at all! I tell you man, I've always been a KDE enthusiast, but I couldn't never found a stable KDE distro that fit my needs, and I used to hate openSUSE so I never really gave it a chance (I always keep ubuntu as my OS), but then they start up the whole unity mess, and then the whole gnome 3 senseless Desktop Environment crap, and then kubuntu is just not stable,... so long story short, openSUSE dit it, with KDE. Better Performance, stability, variety, good support, man!... list will go on and on! So hopefully you'd take back your discrediting words, because this OS is pretty good, and so far the best Linux distro there is out there, and with KDE. Well at least for me it is! I'm an Ambassador with the openSUSE project, and wanted to clarify some things. We of course are grateful for any review that is mainly positive. When we create the LiveCD images, many sacrifices must be made in order to have a functional environment contained in such tiny space. The LiveCD is NOT at all what an installed system would look like, as we have to remove a massive number of packages in order to squish a running system into a CD. We provide the LiveCD images for a few reasons, primarily for those countries where DVD burners etc. are less common (DVD being the vastly preferred installation media)as well as to provide a simple means for a user to check their hardware compatibility with openSUSE. Thus, when running the package management it wants to pull in all the base openSUSE software that isn't included in the LiveCD image. generally, the package management isn't designed to work outside of an installed system, so errors should be expected. The preferred method of installation would be to use the DVD image. The DVD image guarantees no packages are left out of the base system, which also means that updates are only actual updates rather than it still needing to net install the base system. Also, the space on the DVD is used to contain a large amount of optional software, such as development tools and the other environments. With the software YaST module in our DVD, you can select any, or all of our desktop environments. With the DVD it is even possible to do updates to the system packages via. ethernet before ever arriving to your desktop. Generally, the preferred method for creating a LiveUSB is via SUSEstudio. With SUSE studio, you can create your own ideal custom version of openSUSE with exactly the packages you want. Using our simple web interface you can craft an image for a variety of deployment scenarios and any task. In essence, SUSEstudio allows you to create your own spin using nothing more than a simple point and click web interface. Skype and other such software is proprietary, and as such will generally not be hosted in our repositories. Some community members have made downloadable packages that make use of fetching scripts to serve the same effect in the past. There are less of these than there had been. Installing multimedia capability into openSUSE is painless. Simply google "openSUSE multimedia one click." Of course, the Fluendo products for gstreamer applications are also an excellent and simple option. It bears mentioning, that the hideous menu structure is generally the default behavior of KDE. If I recall correctly, there is a means of tuning that differently. Roger, thank you very much for long and explanatory comment! Much appreciated! recently i have sitten on Linux (opensuse exactly). after over many years on windows, it doesn't look very friendly environment. But i'd like mention many performance-issues are based firstly upon configurations. for instance, why'd workstation need to run visual effects of desktop???? most of them even makes work worse, but steadily consumes processor(s) & memory as well + don't forget about crowd of daemons (run from the very boot). not everyone of'em are often needful & some have been completely useless for user. I've been looking for a distro with stable packages in it but more of a rolling-release than having to upgrade or fresh install every six months and OpenSuse Tumbleweed looked ideal over just a handful of rolling distros available. This was the first review I read I was doubting my Core2Duo/Intel GMA based laptop was going to handle it. First I tried the 12.3 LiveDVD which didn't have the dependency issues noted here, yes a couple of updates needed but not hundreds of dependencies. 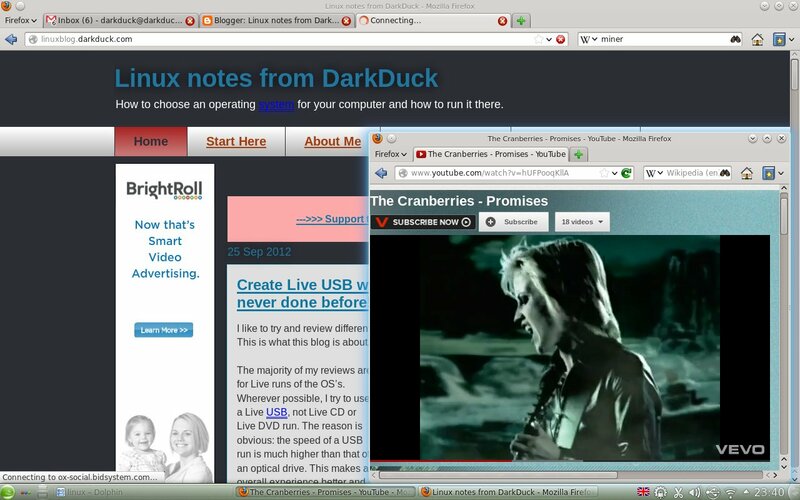 The LiveDVD KDE edition was pretty slow but I've found this with a few live distros with a variety of desktops. Finally, as I had found a selection of other desktops that had packages readily available I decided to go for a full install. What a difference that has made. I've been using LMDE (Mint, not the desktop with X) for a while now along with Xubuntu. I got fed up with my CPU fan on all the time with LMDE and a fair few crashes in XFCE under Xubuntu. The full install is quite nippy for such a heavyweight desktop like KDE. As a developer using QT a fair amount I decided to give Razor-QT a shot. I flick between KDE, Razor-QT and LXDE depending on what I am doing but there is little perfomance difference in any of them. 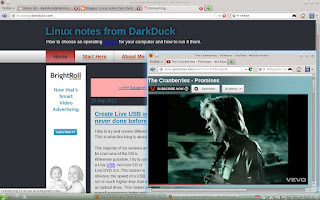 Having said that KDE is sluggish running VirtualBox and Eclipse. Memory usage-wise, LMDE was regularly up to 750mb with Firefox open and OpenSuse seems to have dropped that to about 540mb even while running KDE. I don't have time to start system tuning everything so stock installs are my thing. Overall I wish Fedora was a more stable rolling-release and Ubuntu hadn't gone all custom-kernel-ish and hardware demanding but OpenSuse seems to be filling the gap for me nicely. Just some advice Dark Duck, I know this is your blog but don't hammer people for suggesting an improvement in testing distros. Live distros still just don't have the performance or resources of a full install. Thanks for your feedback! I think the dependency comes with Live CD option, which I tried. It may not come with Live DVD as in your case. Also, you tried 12.2 versus mine 12.3. Lastly, I think the number of additional updates grow with time. It may be minimal just after a new release, but increases as developers release new versions of packages. It is not that bad thing. The bad thing is that you cannot install an application in Live version without being asked to upgrade a significant number of system packages. That's not the case for Ubuntu or Fedora that you mentioned. I only saw it in OpenSuSE, in different versions of it. And last but not least, if you want to give advises on how to write reviews, please start your own blog and write your reviews there. Or, even better, write a review and send it to me for a guest post. There is a good chance to be published! Feedback it was.... and advice at the end of my comment it was too, but not about writing reviews, the advice was about replying to comments. How you reply to comments is your choice but your readers seem to unanimously agree that a Live distro isn't the best way to review a distro unless the whole point of that distro is to be live, like Slax, Knoppix or Puppy. If constructive critisism of your review isn't accepted well people will come here to nitpick your articles rather than be entertained by reading them properly, and you're going to end up with lots of pointless comments about your abilities like in Steven JV Nichols blog. The comments detract from decent articles. I guess it was just a typo but it was me that tried 12.3, not 12.2. My mistake and I will agree that after having tried 12.2 since my comment it is a huge step behind 12.3 and maybe 12.3 should have become 13.0. The reasons why I do (did) mostly Live reviews are listed in the article, available in "Start here" link at the top. If someone disagrees with my approach, it is a free world and "close window" exists in every browser. I don't make anyone to read, that's their personal decision. I think OpenSuSE has published their rules for system numbering. It has nothing to do with stability, purely calendar based. 13.0 can be better, or can be worse than 12.3.